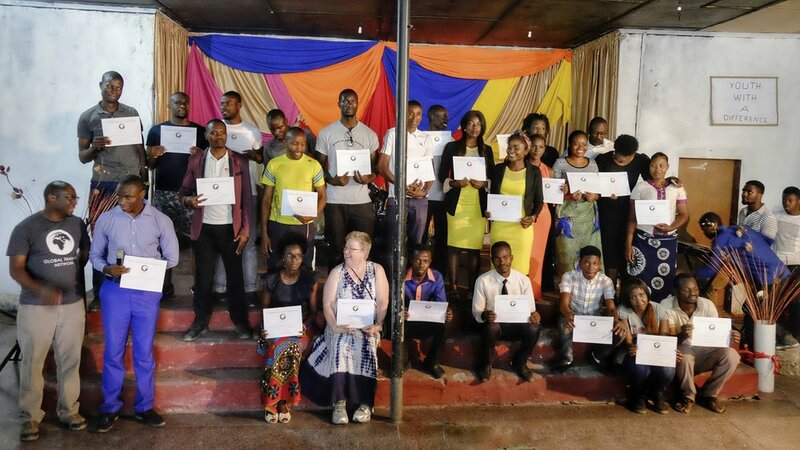 Our Mongu students proudly hold their Certificates of Completion after a week of intensive training! What a fabulous week! We had thirty dedicated students, all of them young (18-35) and eager to learn and grow. We were also able to encourage our dear friend, Pastor Yuyi Mundia, of the Central Mongu Vineyard Church. Saturday and Sunday (9/16) were especially full days. On Saturday, we trained all morning, then met separately as men and women to discuss sexuality issues. Significant conversations were held on this sensitive subject. On Sunday, we worshiped at Yuyi's church. Percy taught on biblical worship during Sunday School, and I preached on the fivefold purpose of the church during worship. That afternoon, we participated in an awesome celebration at Evangel Assembly of God where Abby preached on God's profound love for us, and we also awarded certificates of completion to our students. The church was packed with 150+ youth leaders and youth, and various praise teams led us in worship and dancing. It was simply awesome! In addition to these formal meetings, we had numerous one-on-ones with pastors and leaders throughout the week to discuss issues pertaining to their ministries and families. We were able to be an encouragement to many and received encouragement in return. Thank you for supporting us, for enabling us to do this work. We are profoundly grateful and blessed! Plese pray for our students and us as we begin training a new group of pastors and leaders in Katima Mulilo, Namibia this Saturday. And we will continue to pray for you!